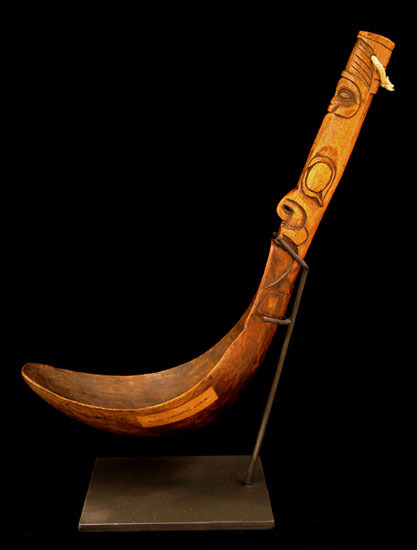 This exquisitely carved Haida ladle, of yellowish colored wood, depicts raven and owl effigies on the handle. The bowl is deep and very thinly carved. There are finely carved and incised geometric tail feather formlines fanning downward on the backside. Note: Most spoons and ladles are carved from sheep or goat horn. Wood ladles are rarer and more difficult to carve to this degree of thinness in the bowl. Provenance: From an old Canadian collection.